This small 4-tube cathedral radio reads "Jewell" on the dial escutcheon and has a manufacture tag on the chassis that clearly states Climax Radio & Television Co. of Chicago and a model AC. 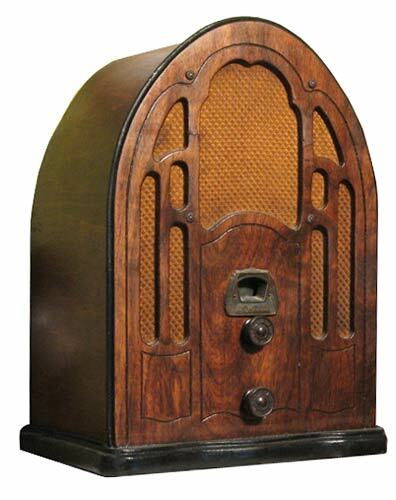 Although the model is nowhere to be found in any records I checked, I have seen several similar radios in ebay auctions with similar chassis layouts and appearances. These cathedrals appeared with various generic names including Radio King and Regal and many had CRTC on the manufacture tags. I believe Climax manufactured and sold this cathedral under generic names like Plant A radios were. The Jewell came in my possession with all the tubes missing and without any success locating the schematic, this radio was quite a restoration challenge. I chose to use a 6A7 and 75 for the RF and audio pre-amp section based on an educated guess of the wiring. I was pleased to find that the radio worked very well after replacing the tubes and capacitors. The Jewell circuitry is fascinating because only one tube (6A7) is dedicated for tuning in a station regeneratively and the 75 and 47 are used for the audio amplifier.